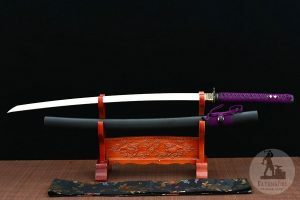 **SHOGUN KATANA ‘NAOZANE from katanafire. Price: $409.00. Discount: $70.00. Categories: Martial Arts, Accessories, Katana, Sponsored. Deal Rating: 4.5 Stars out of 5. Store Rating: 5 Stars out of 5. Deal Recommendation: Recommended. Available Until: Limited Quantity. Thoughts: This Katana is 100% handmade. It is hand forged, hand polished and hand sharpened. The blade is razor sharp. It is made of clay tempered 1095 Carbon Steel. During the hardening process, the difference in cooling time cased by the clay layer results in two different hardness areas. The edge cools faster and forms a very hard steel structure. The body cools slower and forms a very tough steel structure. The boundary between these two areas is called hamon and is commonly seen as a frosted wavy line. The sword makes a whistling sound when swung properly, which is excellent for practicing technique. **WARRIOR KATANA ‘MASANORI from katanafire. Price: $299.00. Discount: $50.00. Categories: Martial Arts, Accessories, Katana, Sponsored. Deal Rating: 4.5 Stars out of 5. Store Rating: 5 Stars out of 5. Deal Recommendation: Recommended. Available Until: Limited Quantity. Thoughts: This Katana is 100% handmade. It is hand forged, hand polished and hand sharpened. The blade is razor sharp. The sword has a Damascus blade made of 1060 Steel. The blade is hand folded and forged 12 times. This process makes the blade harder and more flexible. It also leaves a beautiful pattern behind that characterizes Damascus blades. The sword makes a whistling sound when swung properly, which is excellent for practicing technique. **APPRENTICE KATANA ‘HISAMASA from katanafire. Price: $219.00. Discount: $50.00. Categories: Martial Arts, Accessories, Katana, Sponsored. Deal Rating: 4.5 Stars out of 5. Store Rating: 5 Stars out of 5. Deal Recommendation: Recommended. Available Until: Limited Quantity. Thoughts: 100% handmade Katana. It is hand forged, hand polished and hand sharpened. The blade is razor sharp. The blade is made of 1060 Carbon Steel, providing a great balance of hardness (edge holding ability) and strength. The blade makes a whistling sound when swung properly, which is excellent for practicing technique.